Let me tell you a story. Stick with me. I used to teach creative writing classes called Freeing Your Creativity. I taught a lot of them, especially, in the early- to mid-2000s. I’d talk about what makes a story work, a bit about story structure, and we’d do written exercises for creativity. At the beginning of the class, to loosen people up, I’d do two or three two-minute writing sprints based on a first-sentence prompt I’d provide. Because I wanted to set a good example and because it was more interesting to me if I did, I’d do the exercises along with everyone else. Two minutes later, I had a cute germ of an idea about a mother chipmunk who was trying to convince a princess to marry her son, despite his utter unsuitability. The idea stuck with me, and over the years, I’d tweak it and see if it would go anywhere. Every now and then, I’d take it out add a few hundred or a thousand words. But somewhere around 15,000 words I completely bogged down. In April of 2016, I thought, “I have to finish this thing.” I put myself on a media fast (no podcasts, no audio books, no anything) and just let the story rattle around in my head. Between that and discussing it with our daughter, Tamsin, who is wonderful and very good at this kind of thing, I got a framework for a story which had a beginning, middle, and end. I finished the first draft in January of 2017, and kept writing, because the story wasn’t the little 35k word YA novella I thought it was going to be. It had grown into something more substantial, a multi-book humorous YA series that you’ve heard me talking about if you’ve been with me for even a little while. 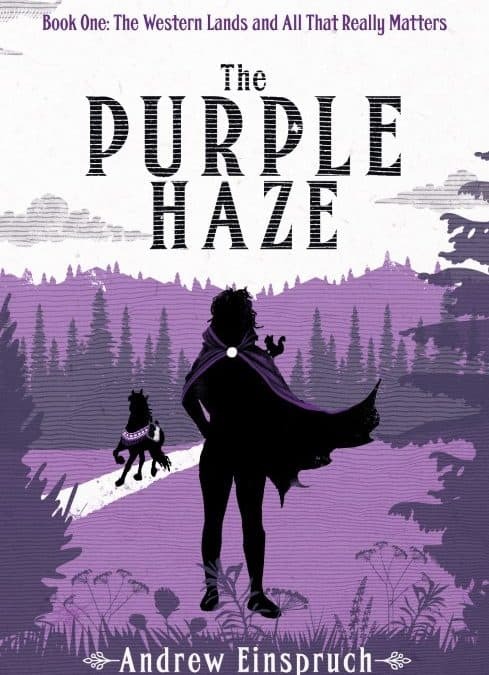 My fellow human, it gives me incredible pleasure to let you know that The Purple Haze, book one in the Western Lands and All That Really Matters series is ready for you to enjoy. I can’t tell you how thrilled I am to be able to write that sentence. Do you know what the first line of the finished novel is? After all this time, it’s still there. At the moment, The Purple Haze is exclusive to Amazon, and ebook only (I’ll get to paper soon, I promise). If you’re in Kindle Unlimited, you can get it that way for free. If you use a different Amazon store, just do a search of the title and my name. It’ll show up. Thank you for giving The Purple Haze a try. I hope you enjoy it.